The National Theatre may not have done anything special this week to celebrate the Brecht centenary. But at least they are reviving Mikhail Bulgakov's Flight in the Olivier. And the first thing to hit one about this extraordinary satiric epic, banned before performance at the Moscow Art Theatre in 1928 and only premiered in 1957, is how it deals with classic Brechtian themes: exile, pursuit and the difficulties of survival in chaotic, dangerous times. Bulgakov himself knew a thing or two about survival. In 1930 he famously wrote to the Soviet authorities begging for emigration or employment. He was phoned by Stalin himself in what he took to be a hoax-call, given a minor post at the Moscow Art Theatre and ensured his posthumous fame through two masterly novels, Black Snow and The Master And Margarita. Unlike Brecht, he never reached an accommodation with state power. What the two writers share is an ironic temperament and a fascination with endurance in the face of historical confusion. That is the running theme of Flight, which Bulgakov described as "a play in eight dreams". In those dreams it follows the capricious fortunes of a group of White Russian soldiers and civilians from defeat in the Crimea in 1920 to exile in Constantinople and Paris. It deals, in particular, with four characters: Charnota, a Cossack major-general rescued from total destitution by his gamblers' instinct; Khludov, the autocratic White Army chief of staff ludicrously encased in military discipline; and Golubkov , a St. Petersburg professor hopelessly in love with Serafima, the deserted wife of a deputy minister. What Ron Hutchinson's agile new adaptation brings out, however, is Bulgakov's gift for making serious points through black farce - Joseph Heller comes to mind as well as Brecht. As played by Alan Howard, Khludov is an insane butcher who has sent whole regiments to their death and who arbitrarily hangs anyone who crosses his path. Yet it is Khludov who points out to his absconding commander in chief that it is always idiots who rise to the top and who, forced to earn a living in Constantinople by pumping out music from a barrel organ, remarks in wonderment, "civilian life always seemed so complicated". What Howard captures perfectly is Khludov's paramount absurdity and automaton-like nature - as Bergson pointed out, comedy always starts when man reacts to life like a machine. Clearly the play is intended as a satire on the White Russian leaders. But what makes it so intriguing, and what prresumably incited the Soviet censors, is its regard for their resilience, cunning and luck. If Khludov survives by his myopic disregard for reality, Kenneth Cranham's wily Charnota does so by trusting to his gambler's antennae. He outwits the Reds by posing as a pregnant woman, bets on cockroach races and, in the play's funniest scene, wins a million dollars at cards off a fellow émigré in Paris. In many ways, the play is alien to British experience: it is about the tenacity of the refugee-spirit and, in the end, about the Russian longing for home. But it survives, theatrically, through its quicksilver shifts of tone and its pervasive irony. 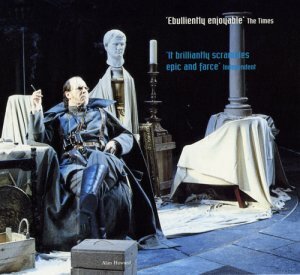 It works very well in Howard Davies's spectacular production, for which Tim Hatley has designed a brilliantly flexible set: one dominated by a panelled back wall that opens up to become a Crimean palace occupied by mobile, white-sheeted statuary or a bustling Turkish street brim-full of carpet, hookahs and birdcages. Davies, however, rarely allows the production's monumental scale to obscure the quirkiness of character: Michael Mueller as the love-smitten professor shows how an idée fixe triumphs over a collapsing society. Abigail Cruttenden as Serafima embarks on a life of prostitution as innocently as if she were going out to do the shopping. And Peter Blythe is especially funny as the fugitive commander in chief who fusses about the prose style of a newspaper report even as the White Army faces defeat. That moment eptomises the strength of Bulgakov's blackly sardonic play. He sees history as an insane mixture of the tragic and the absurd - a lesson ultimately learned after years of suffering at the hands of the Bolshevik victors.